Can you believe this is polymer clay? Some of these pendants do not even have any backing, and their walls are as thin as paper! Amazingly, they are strong enough to withstand normal wear as a piece of jewelry. Follow this tutorial to find out how to make polymer clay pendants, beads, and earrings based on these openwork designs. These designs are inspired by the images one may see under a microscope, hence the name of this tutorial. A separate troubleshooting section explaining what difficulties you may face with this technique and how to deal with them. 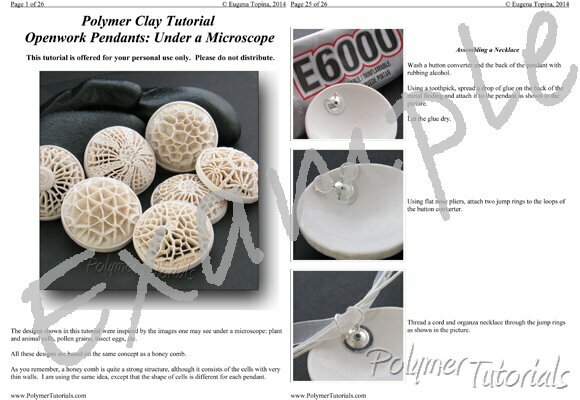 Note: This is a new revision of the original Openwork Pendants tutorial. In this version the step that used to require a waiting period of up to a few days is now reduced to a couple of hours. All pendants shown on this page are demonstrated in the tutorial. Place a mouse over the small pictures to see them enlarged. Clair et précis! Juste génial! Tank you! Teresa (France) ..